It was great to meet you, too. As for my profile pic, it's gonna have to do until that Fauth guy puts his brunch pictures on the Interwebs. Hi Amy. 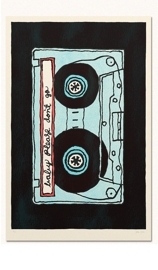 You look an awful lot like a mixed tape. It was so great to meet you last weekend. Wish that you were around for the final NYFF parties. You must log in to write on Amy Monaghan's wall.